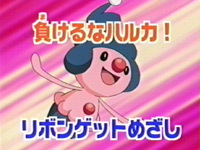 Japanese Episode AG 163: "Pokemon Contest! The Yuzuriha Convention!!" Haruka has arrived on Yuzuriha Island, the site of her next Pokemon Contest! The young Coordinator meets up with Shuu, who informs her that he's not competing this time. He also tells Haruka that he's not the one who sent her the letter and the rose back on Modama Island, confusing the young girl from Touka City. Later, Haruka meets the real sender of the letter - a young girl named Wakana. Wakana reveals that she's a huge fan of Shuu and tells Haruka that she won't let her get in the way of their love! A confused Haruka enters the Contest with her Gonbe stepping up for the Appeals round. The Coordinator takes a chance by having Gonbe use Metronome, but luckily for her, she is able to work around the Rest attack the technique produces. The second round's contestants are announced, and Haruka, Wakana, and Musashi all make it through! The first match of the second round pits Musashi and Manene against Haruka and Wakashamo. The fire-type easily wins, allowing Haruka to advance through the rest of the semifinals. Before long, Haruka is ready for the final round against Wakana's Vibrava! Wakana uses Sand Tomb to trap Wakashamo, but Haruka's starter is able to get out of it with a handy Mega Kick. With a new technique under its belt, Wakashamo finishes the battle and earns Haruka the Yuzuriha ribbon. As Haruka waves goodbye to Shuu and Wakana, Satoshi gears up for his next challenge at the Battle Palace. The Battle Frontier saga has a number of problems, such as horrible pacing and a lack of captures, but one of the bigger issues I have with it is the whole Contest arc. Let's face it - the anime producers got lazy. They only make up like two real rivals for Haruka - Ogata and Wakana - and use regulars like Harley and Musashi to fill out the rest of the Contests. It's as if the writers are tired of the whole Contest story arc by this point and are just going through the motions. So when we're faced with an episode starring a real rival, it's something to take notice of. Wakana's a great addition to Haruka's list of people she's pissed off along the way, and I really hope to see her again. All of her pokemon are the pre-evolved forms of Shuu's pokemon, so if she ever does show up again, we can be sure that she'll have a Subomi on her team. Sure, she may basically be a less bitchy version of Eriko (just replace Toshiki with Shuu), but at least she's not Harley for the umpteenth time. One funny thing I noticed is that the Nyorotono trainer Haruka defeated in "Gonbe's Debut Battle! An Earnest Fight with Harley!" returns in this episode, only to be defeated by Haruka in the second round again! I don't know who this guy is, but if I was him, I'd be pissed. The dubbed version introduces us to PUSA's version of Shuu, and...it's not that great. It's not terrible voice-wise, but the acting leaves a lot to be desired. And then there's Briana. Rocketshipper, a member of the Bulbagarden forums, said that Briana sounds a lot like Kate Monster from the Broadway musical Avenue Q, and I think that's a fair enough assessment. Except that Stephanie D’Abruzzo can act and isn't as high-pitched. While I do applaud the decision not to go with the typical "filler girl" voice, I'm sure they could have come up with something better than...that. Roselia, Ametama, and Vibrava keep their Japanese voices. In the Japanese version, we can hear the fourth Advanced Generation opening theme, Pokémon Symphonic Medley, play from the time Wakashamo learns Mega Kick until it wins the battle. In the dub, we get all instrumental stuff. The TO BE CONTINUED... screen is made three seconds longer in the dub...for now~ it's only for now~!